(Phys.org) —Scientists have determined that an asteroid that burned up over Russia in February resulted in a shock wave so powerful that it traveled twice around the globe. They made that determination by means of a system of sensors used to detect evidence of nuclear tests. Researchers studied data from the International Monitoring System network operated by the Comprehensive Nuclear-Test-Ban Treaty Organization. Its stations monitor ultra-low frequency acoustic waves, or infrasound, from nuclear test explosions. The system can also detect blasts from other sources. According to BBC News, it was the most powerful event ever recorded by the network. 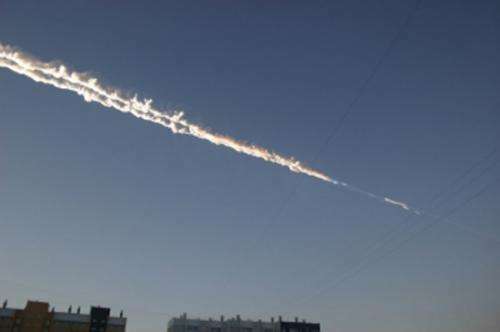 The 10,000-ton space rock burned up above Chelyabinsk. The BBC said Alexis Le Pichon, Atomic Energy Commission in France, and his research colleagues reported that the explosive energy of the impact was equivalent to 460 kilotons of TNT. Writing in the Geophysical Research Letters journal, their article is titled "Russian Fireball Largest Ever Detected by CTBTO infrasound sensors." Authors are Alexis Le Pichon, Lars Ceranna, Christoph Pilger, Pierrick Mialle, David Brown, Pascal Herry, and Nicolas Brachet. "On 15 February 2013," they wrote, "a large Earth-impacting fireball disintegrated over the Ural Mountains. This extraordinary event is, together with the 1908 Tunguska fireball, among the most energetic events ever instrumentally recorded." The 1908 reference is to the event that occurred that year in Siberia. As for the February event, the authors noted that, after circling the globe, it generated infrasound returns at distances up to ~85,000?km, and was detected at 20 infrasonic stations of the global International Monitoring System. Multiple arrivals involving waves that traveled twice round the globe were identified. "A preliminary estimate of the explosive energy using empirical period-yield scaling relations gives a value of 460 kilotons of TNT equivalent. In the context of the future verification of the Comprehensive Nuclear-Test-Ban Treaty (CTBT), this event provides a prominent milestone for studying in detail infrasound propagation around the globe for almost three days as well as for calibrating the performance of the IMS network." Their numbers suggest the February asteroid event is the most energetic event reported since the 1908 Tunguska meteor in Siberia. Turning to Tunguska, another team of scientists published a study offering their evidence of the meteoritic origin of the Tunguska cosmic body. Their discussion of the 1908 fireball is in the journal Planetary and Space Science. Diamond–lonsdaleite–graphite micro-samples collected from peat after the 1908 catastrophic blast in the Tunguska area were studied with scanning (SEM) and transmission electron (TEM) microscopy, NanoSecondary Ion Mass Spectrometry (NanoSIMS) and an X-ray synchrotron technique. Looping waves are great, replace earth by universe and replace shock wave by gravitation/gravitational wave, then you knocking the door of my universe or maybe the Universe. and the end of all life on earth as the alarmists model it.